The Ancient Greeks believed that everything in life was controlled by a god or goddess – so, if the crops didn’t grow very well one year, they thought it was because the goddess of the harvest (Demeter) wasn’t happy. The gods and goddesses looked like humans, but they lived forever. As a way to keep the gods and goddesses happy, the Greeks built a temple for each one. Priests were in charge of the temples and letting everyone know what the gods were trying to tell them. The Greeks would also hold festivals for the gods, and sporting events like the Olympics. The Greeks told many stories about things that the gods did – this is called mythology. The Ancient Greeks were very religious people, and believed that many different gods controlled everything that happened in life. Temples were built for each god. Priests in the temples were in charge of speaking to their particular god or goddess, and making sense of what they wanted the Greek people to do. To please the gods even more, festivals were held in their honour. The Olympics began as a sporting festival held to honour the god Zeus. Zeus was king of all the gods, and he controlled the weather. The Greek gods were humans who looked like you and I do, but they were immortal (they could live forever) and had special powers. There were 12 main gods and goddesses, and they all lived on Mount Olympus – the highest mountain in Greece. The gods and goddesses weren’t always very nice. They could be just as mean to each other as they could be to mortals, which made it more difficult to know how to keep them happy. Because the gods had their own personalities, stories about them were told to explain why they acted the way they did – this is called mythology. In addition to gods, the Greeks believed in mythical creatures such as centaurs (half human, half horse) and Cyclopes (monsters with only one eye). These would often show up in mythology too. The Greeks also believed that after people died, they went to the Underworld (like the Ancient Egyptians). The underworld was ruled by the god Hades, and to get there the god Hermes helped people cross the River Styx. The king of all the gods was Zeus, who was in charge of the weather. The Greeks thought that lighting bolts were Zeus’ weapons, and that he threw them when he was angry. The Olympics began as a festival of different sports, held to honour Zeus. The Ancient Romans also believed in some of the same gods as the Greeks did, but the Romans called them by different names. You can see some of the differences in the chart below. Which of the Roman names are also the same as what we call some of the planets? There were 12 main gods, and the Greeks believed that they all lived on top of Mount Olympus – this is also the highest mountain in Greece. These 12 gods were called the Olympians. The only Olympian who didn’t live on Mount Olympus was Hades, who was the god of the Underworld. Even though they were gods, none of them was perfect – they could be grumpy, sad, jealous or happy, and throw parties, get married and have children just like humans. The Greeks used all of these characteristics to make up stories, which were told to children. These are called myths. Greek mythology can be a lot of fun to read. For instance, one of the myths is about King Midas, who wished that everything he touched would turn to gold. His wish was granted one day, but King Midas wasn’t too happy – he realised that he couldn’t even eat without his food turning to gold! He learned that there are more important things than riches, so asked for his new power to be taken away. Can you find the following in the gallery below? Most city-states had an acropolis, which was a collection of temples built on top of a high hill. Acropolis means ‘high city’, and it was a place where the citizens of the city-state could go to for safety if there was an enemy invasion. Athens was named after Athena, who was the goddess of wisdom. The people who lived in Athens believed that Athena was their patron goddess – this meant that she would protect Athens from the other gods when they got angry. The Parthenon in Athens is a large temple built to honour Athena. Each city-state had a patron god. Creating a temple for a god meant putting their statue inside it, and maybe even decorating it with the god’s symbols. People went to the temple to pray to the god/goddess and bring offerings, such as treasures or food. Priests were put in charge of the temples, which meant that they were the ones who communicated with the god or goddess. The priest could interpret what the gods wanted, and make sure they were kept happy. The Underworld is where the Greeks believed that people went after they died. The Ancient Egyptians also believed in an Underworld, but the ones that the Greeks believed in was a little different. Hades was in charge of the Underworld, and the god Hermes would guide people along to the River Styx – this separated the world of the living from the world of the dead. It cost money to be ferried across the River Styx, so when people were buried their families would place a coin on their body to make sure they could pay the fare. Once you crossed the River Styx, you’d join other souls in the afterlife – but nobody stayed around there for too long. The Greeks believed that souls of the dead would be reborn, so you’d only have to stay around the Underworld as long as it took for your soul to wait in the rebirth queue. This story about the Underworld is part of Greek mythology. 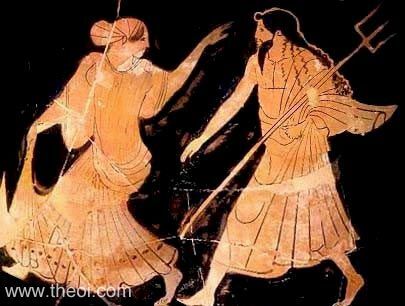 References to the different myths can be found in pictures painted on vases, and in Greek literature like the Iliad and the Odyssey by Homer. Each god had certain symbols that would help you tell which was which – for instance, Poseidon (god of the sea) always carried around a trident, and Aphrodite (goddess of love) is usually shown with doves. 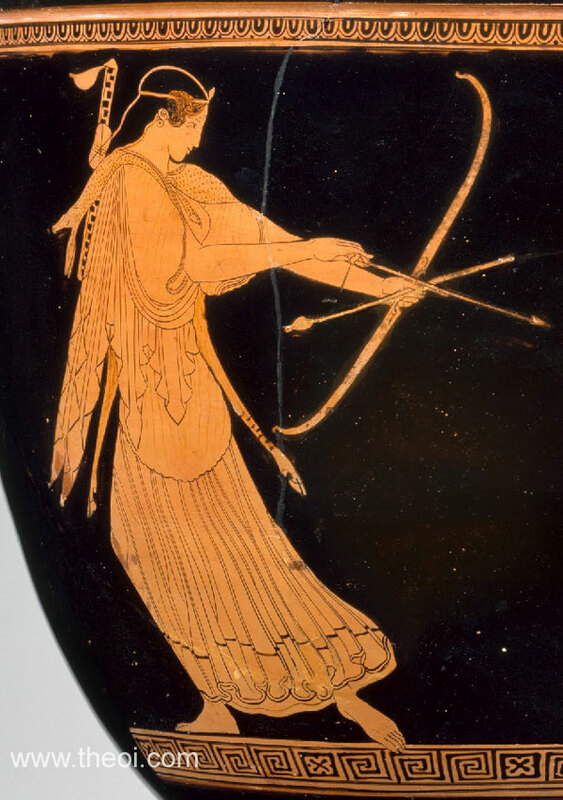 Artemis is the goddess of hunting, and she’s pictured with a bow and arrow. Some of the best myths involve heroes – people who did brave and noble things. One of the favourite heroes was Heracles, who was Zeus’ son. He was brave even when he was a little baby – he saved the life of his brother by killing snakes that had been released into their nursery and meant to kill them.